How do you manage your digital documents? Do you scan using one application, then manage those scans using another application? 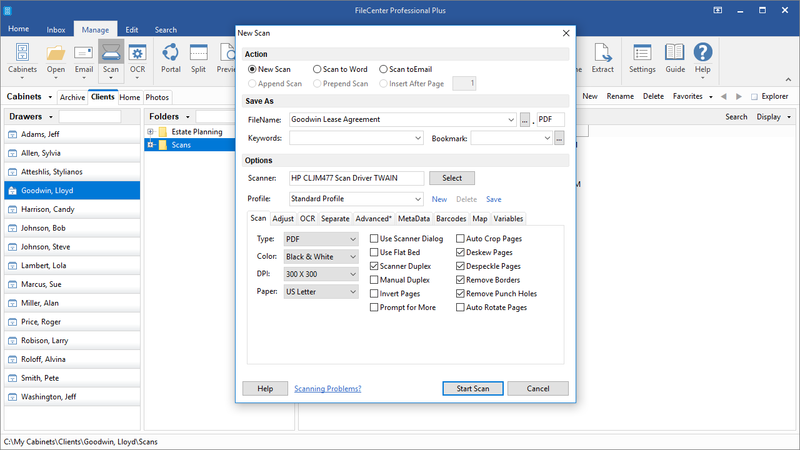 Time to streamline your workflow with today’s discount software promotion, FileCenter! FileCenter provides you all you need to scan and manage documents in one simple application. 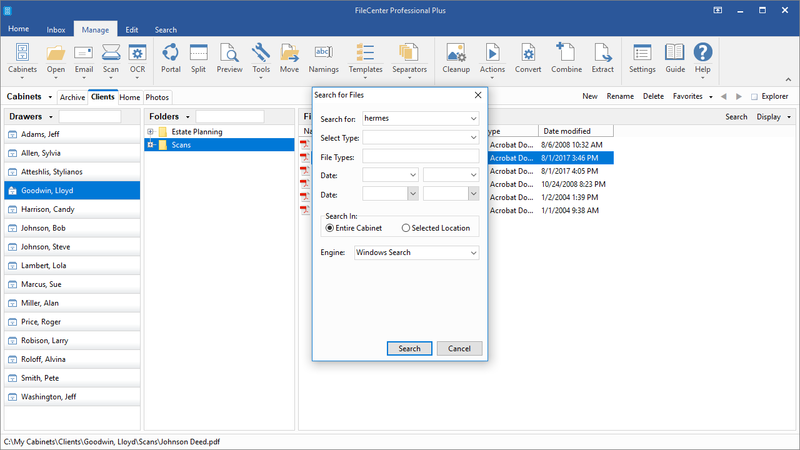 With FileCenter, you’ll be able to get up and running quickly, without the need for setting up complex document databases. What’s more, FileCenter is very intuitive, with no learning curve, even for users with limited technical expertise. Need more guidance? FileCenter comes with How To and Training videos! 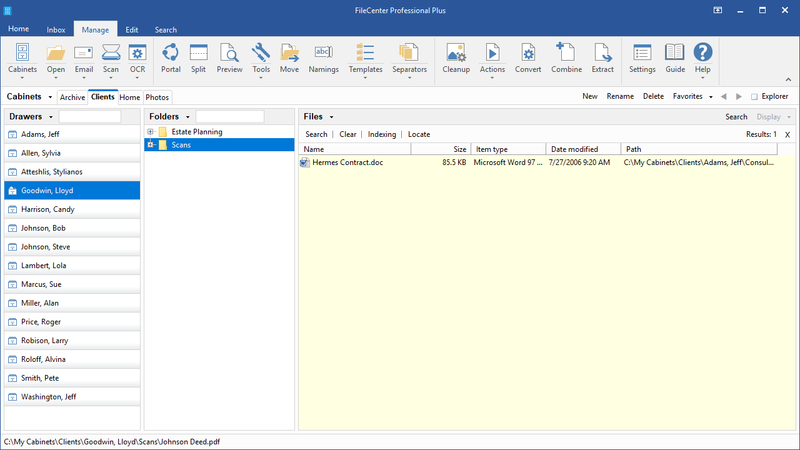 What do you get when you install FileCenter? 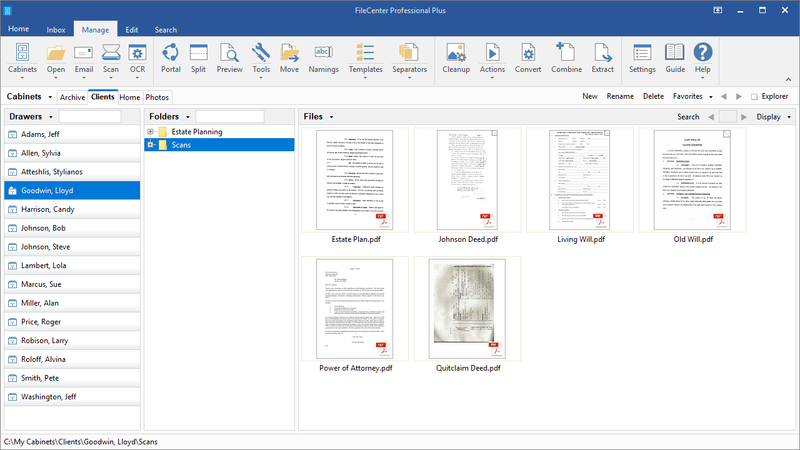 How about the ability to create and edit PDF documents? 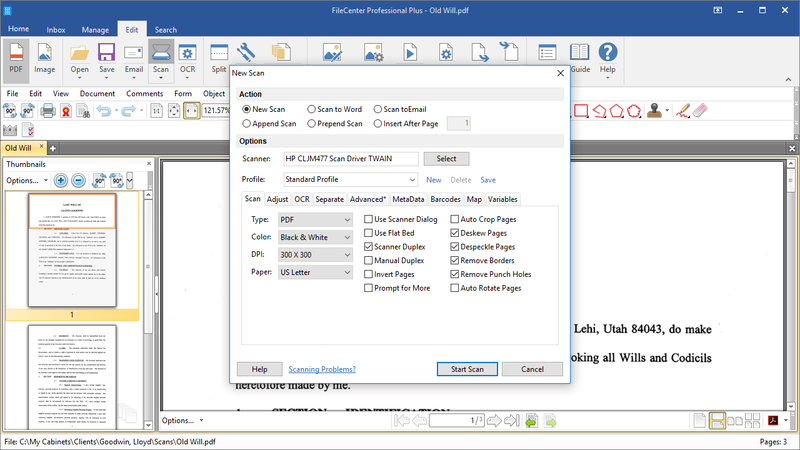 Scan hardcopies into searchable digital formats? Organize your documents in electronic file cabinets that you already know how to use. You can even preview files without ever needing to open them! Best of all, FileCenter works with all major cloud services, so you can access your files anytime, anywhere! After you purchase FileCenter it may be used indefinitely. 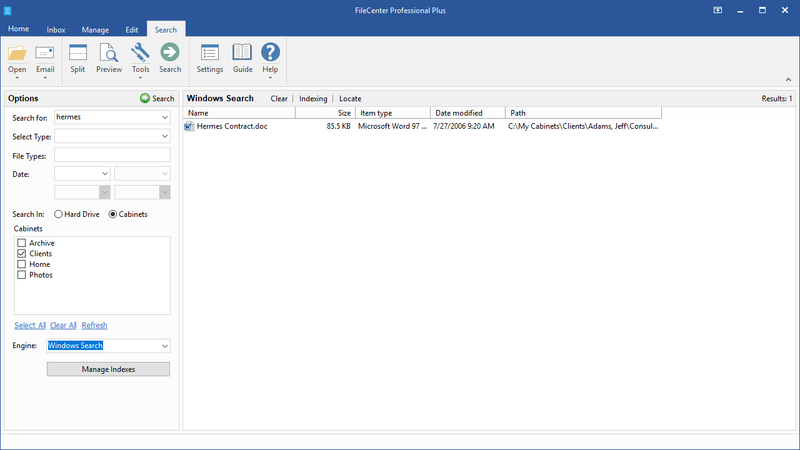 FileCenter is licensed per user, so if more people are going to use FileCenter you will need to purchase additional copies. Upgrades to future versions of the software will be free for 12 months. For versions after that, upgrades will require additional payment, which will be discounted. It will be discounted only if you've purchased the last major version. “I have a full time job, over a dozen rental properties, an aging parent, and a child with medical issues. This generates a lot of forms, invoices, and other documents every week. I was overwhelmed, never had the right papers at hand, and had several filing boxes of paperwork going back 5 months to process, organize, and file. I needed help and researched electronic scanning and filing solutions.I was skeptical about FileCenter, at first. Charging for a program that would scan and rename files for me seemed too simple to be of any use. After all, I had a scanner and OCR software already installed on my computer and could rename files myself. However, I decided to give it a try and downloaded the free trial. I watched several of the tutorials, and scanned and caught up on everything in one weekend. I couldn't believe how easy and painless it was. Now, my files are all available at the push of a button. A week of paperwork that could have taken hours takes about 15 minutes to manage, and with better results.The simplicity of FileCenter is what makes it so powerful. Simplifying scanning and saving files with consistent naming conventions really does make a difference.”- C. D.
“INALLY! 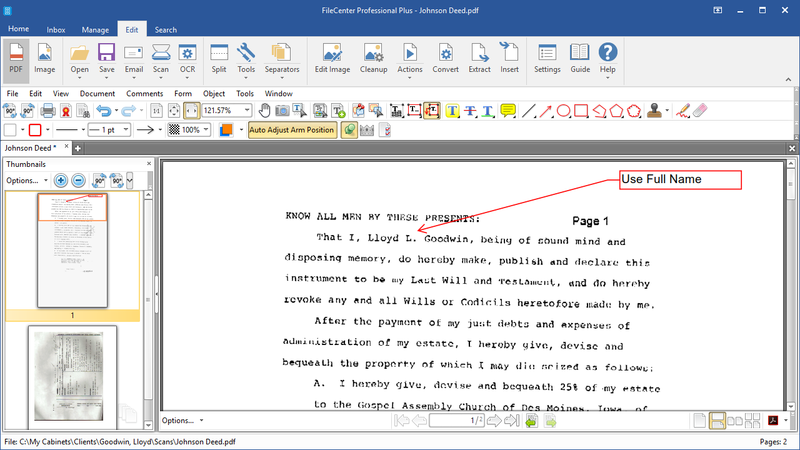 I've been struggling with PaperPort for several years with buggy operation and terrible technical support. I vowed to never buy a Nuance product again. With some healthy skepticism, I tried FileCenter Pro and within 24 hours I was sold ... spent the $200 without batting an eye and it continues to be well worth my investment. The program continues to impress me and has been very stable on Windows 8.1 x64 with my Fujitsu FI-5120C. I've scanned over 6,000 pages since my purchase less than 2 weeks ago. Not a single hiccup. Great job to the developers and QA department! This is an excellent product. I'm very pleased I tried it out and eventually became a very satisfied customer. Thank you! !”- M. B. “Apart from my day job as a lawyer, I write the "Hands On" tech column each week in the Australian Financial Review. AFR is roughly equivalent to the Aussie version of the Wall Street Journal. Thought you'd like to know that we ran a piece on FileCenter a couple of weeks ago, and it has generated more than a little interest. I've been running a few trial editions at my law firm to get other perspectives on FileCenter, and I now have a problem :-) My people aren't willing to let it go.... It looks like FileCenter is here to stay in this office! It's a great product, so keep up the good work. Cheers.”- P. M.
“We have used FileCenter to make our paperless accounts payable process extremely easy for each department. I told them they weren't required to use it, but that it would make their lives so much easier. And everybody has jumped on board and is LOVING it! That's really an impressive statement because we've got such a diversity of folks, from public works to public safety – and I am only hearing good things. I think this is truly a first for us .”- L. O., Reedley, CA. 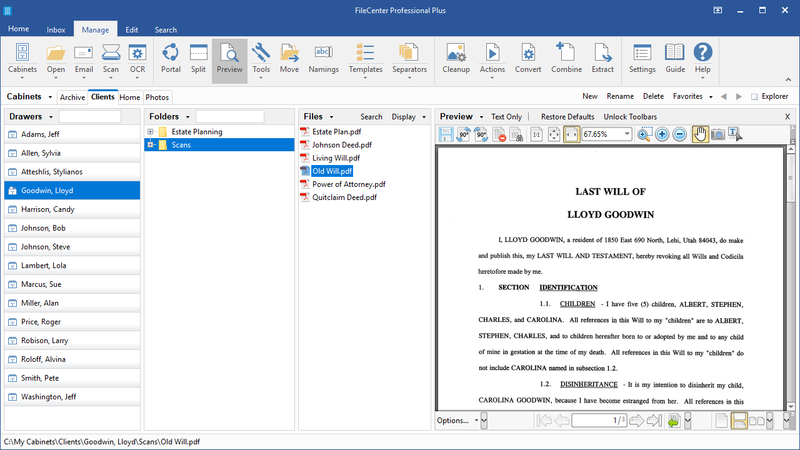 “FileCenter continues to be an essential component of my professional work. I wear many hats – attorney, mediator, court administrator, adjunct professor, statewide state bar committee co-chair, legislative expert witness. FileCenter helps raise each of these efforts to a high level of professionalism.”- D. L., Esq. “Hi folks, just wanted to drop a line and say THANK YOU. 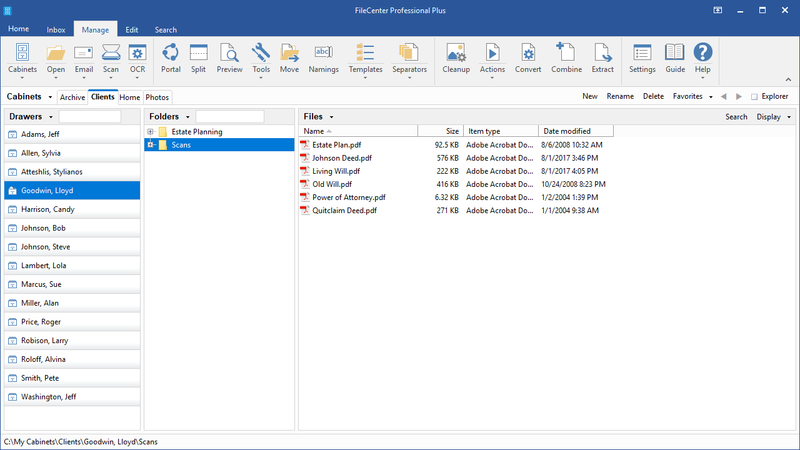 When I originally purchased File Center, I was struggling to come up with proper workflow for scanning and organize a lot of files. This was made even more difficult given that I use an MFP Scanner, not a Fujitsu, etc. I finally gave REGEX renaming a try. It works like magic and has made it very easy and fast for me to scan, OCR, and organize my files.”- N. Z.